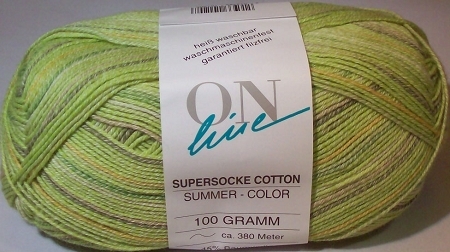 3.5-oz (100-gram) balls of Online Summer Color sock yarn. Each ball contains approximately 414 yards. One ball is enough to make one average pair of socks. 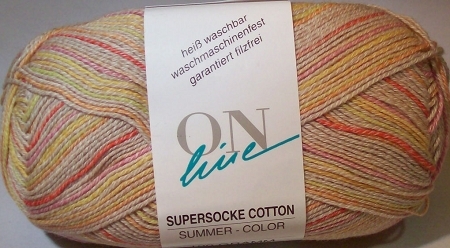 Online Summer Color is a soft cotton-merino blend sock yarn that breaths well and wears well. The colors of this line include soft pastel hues. It is also machine washable. 45% Cotton, 40% Wool, 15% Poly. 30 stitches= 4" on US size 1-2 knitting needles.